ע"ש רב ישראל לעפקאוויץ ז"ל According to Daas Torah, internet usage is only permitted with proper and adequate filtration. To paraphrase the legendary Agudath Israel of America chairman Rabbi Moshe Sherer z”l, activism on behalf of Orthodox Jewry must focus as much upon the needs of “Reb Yisroel” – the individual Jew – as it does upon broader community. Every Jewish family should be permeated with warmth, spirituality and optimism. Agudath Israel of America offers various programs to help both parents and children make their family life as ideal and constructive as can be. 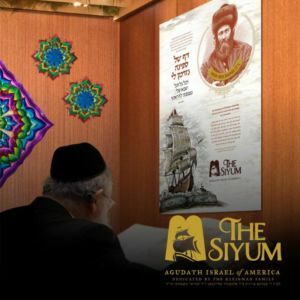 Whether improving children’s formative years, their parents’ financial stability, or their grandparents’ experience during a terminal illness, Agudath Israel of America has designed various programs to brighten the entire picture. Throughout history, Jewish communities have thrived due to a unique cohesiveness and burden sharing, and powerful institutions at their core. Agudath Israel of America is dedicated toward strengthening the ingredients that make our communities work well for all their members. Get your FREE custom Daf Yomi Sukkos Art! For those of us dedicated to the Daf, its daily study is so much more than just a daily shiur. Your commitment to The Daf is legendary. Your dedication is an inspiration to so many. No matter where you are, no matter what is going on you never leave The Daf. You embody the commitment of לא נתנשי מינך…ולא תתנשי מינן. Just as when You leave your home you always take The Daf with you, this Sukkos, as you move out of your home into the Sukkah, you can take The Daf with you too. The Agudah has commissioned a beautiful commemorative Daf Yomi piece of art, created especially in your honor, for you to adorn your Sukkah and cherish The Daf with your family. If you or someone in your family is a Daf learner, please sign up today to receive your amazing free Sukkah poster. The poster features a stunning drawing of the legendary Rav Meir Shapiro, founder of the Daf Yomi and an inspiring quote from his speech given at the Knesiah Gedolah of Agudas Yisrael in Vienna in 1923. The plank of a ship came before me. I grabbed hold of it and floated to safety, nodding my head to each and every wave. The stunning artistic rendition of this Gemarah is sure to be a source of inspiration to you and your family this Sukkos. There are now less than 500 dafim remaining till the upcoming 13th Siyum HaShas to be held on January 1, 2020. Plans are already underway to make the upcoming Siyum the greatest yet. As a Daf Yomi learner, this celebration is your celebration. We want you to be the first to know all the details of this event. In order to do so, we need to know how to reach you. Signing up for your free Sukkos poster will ensure that we have your up to date contact information so that as updates become available, and as tickets go on sale you’ll be the first to know. So don’t just stay up to date on the Dafm stay up to date on the Siyum too. Sign up now at TheSiyum.org.